No DLCs for the PC version. DLC content can still be accessed by modding the game, see How to get DLC cars and tracks. SecuROM PA DRM, unknown machine limit. A De-Authorization Tool is available. Never officially released on PC; ported by modders (see How to get DLC cars and tracks). Latest version is 1.0.2. It can be downloaded here for European players, and here for American players. Requires you have previously patched the game to 1.0.2. Users of NoGripRacing forums, made a community patch that fixes many of the bugs left in the game and improve driving experience. Remember to follow carefully the installation guide. Delete or rename Attract.bik and Franchise_Ident.bik. Added in a patch (see Patches). NFS Shift will experience fps stuttering when running on Windows 8. Run the game in compatibility mode for Windows Vista (SP2). NFS Shift can experience extremely slow loadings when running on Windows 10. Run the game in compatibility mode for Windows Vista (SP2). Right click on icon and click on "troubleshoot compatibility". Don't set the Refresh Rate to 144Hz in the game options. 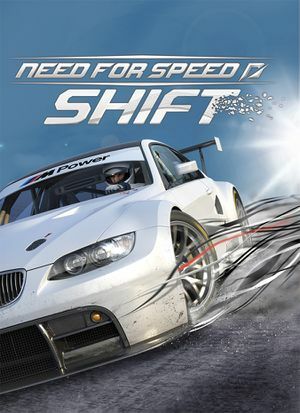 Install the NFS Shift 1.02 patch for your region. Unpack your game with Shift unpacker. Copy JSGME to the installation folder. Run the executable and allow it to create the MODS folder. Download the DLC files (cars and tracks) and extract them in the MODS folder. Run JSGME again and click the right arrow button to install the DLC files. Add -loose to your NFS Shift shortcut/launch options. ↑ 1.0 1.1 File/folder structure within this directory reflects the path(s) listed for Windows and/or Steam game data (use Wine regedit to access Windows registry paths). Games with Steam Cloud support may store data in ~/.steam/steam/userdata/<user-id>/24870/ in addition to or instead of this directory. The app ID (24870) may differ in some cases. Treat backslashes as forward slashes. See the glossary page for details.